I got my copy of the Yellow Book this morning. 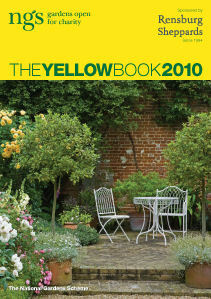 It is a wonderful feeling to flick to the Hampshire section and see our entry (garden name – Barhi). The next thing is to check out our competition for the day. There are only four others open in the county on the Saturday (5 June) and two of them are within a short drive, so that should be a good day for visitors who want to visit a few gardens in the same trip. Sunday 6 June is altogether a busier day with thirteen gardens in total open in the county. It will be interesting to see how visitor numbers compare on the two days.